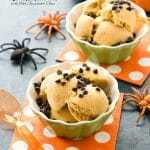 This Pumpkin Spice Ice Cream is creamy, luscious and bursting with pumpkin pie flavor! You’d never guess it’s dairy-free and vegan. A great seasonal celebration for Halloween and Thanksgiving too. This allergy-friendly post is sponsored by Enjoy Life Foods. All opinions are my own. I’m getting so excited for Halloween! The recent recipes for Creepy Shirley Temples, Swampy Frog Egg Pudding and Witch Hair Pasta were a clue I suppose. During this past week I surprised my family by pulling out all our decorations collected over the years and completely tricking out the house (inside and out). It changes the mood and gets everyone excited for spooky fun to come! As thrilled as we are for Halloween, it’s a dreaded holiday for many with food allergies. The big concern when I was growing up was if someone gave us an apple and the fear there was a razor blade in it. These days unless you know someone personally, fresh foods are off the table. 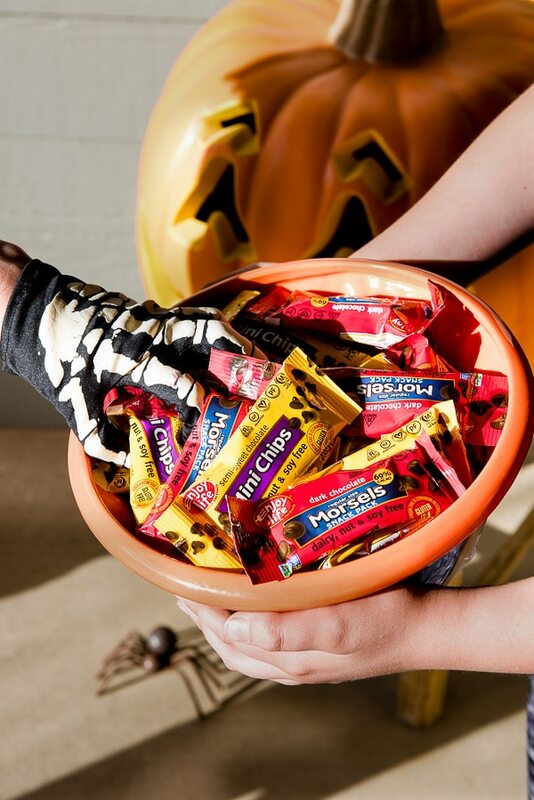 And if you have food allergies the options can narrow to the point of Trick-or-Treating being a total nightmare. 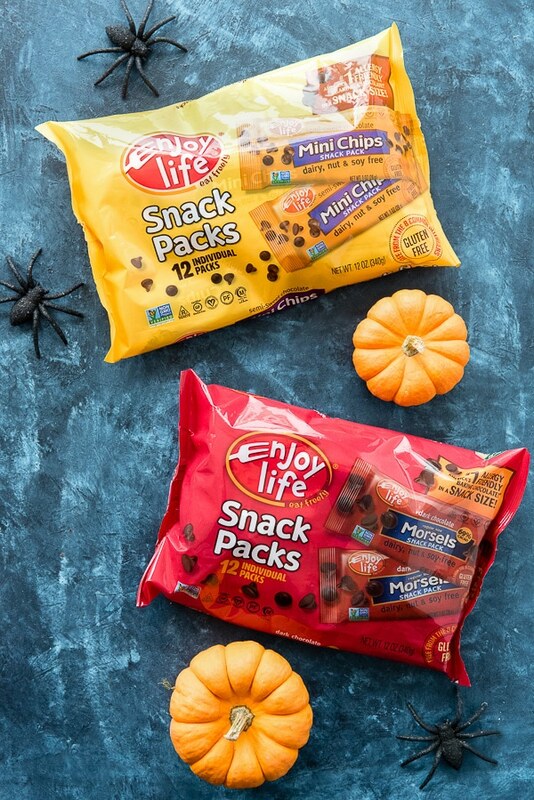 We typically give out glow bracelets but this year I’m so excited because Enjoy Life Foods, purveyors of allergy-friendly foods, has just come out with semi-sweet chocolate Mini Chips Snack Packs and dark chocolate Morsels (regular size) Snack Packs. They are ‘allergy-friendly’, gluten-free and free from the top 8 allergens. Most importantly of course, they taste great. If you are free from food allergies yourself this may not seem like a big deal but especially for kids affected with food allergies having products available to allow Trick-or-Treating safely is huge! You may have seen teal pumpkins over the past few years in the media? Houses which have non-food treats for ghouls or goblins can place a teal pumpkin on the porch so families know that house is a safe option for Trick-or-Treating. Now these snack packs offer the same option for those affected with the top 8 allergens. 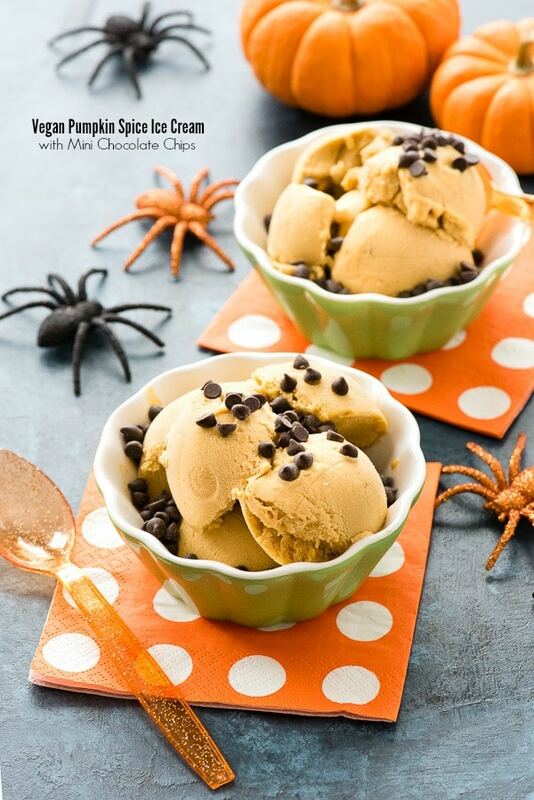 I was lucky to save enough of the new snack packs from my kids devouring them (they come 12 individual packs in a larger bag) to use them in a fun seasonal dessert recipe: Vegan Pumpkin Spice Ice Cream. Also free of the top 8 allergens, this ice cream (and I can call it that since it’s made with coconut cream) tastes just like pumpkin pie filling. It’s creamy and luscious with the flavors of the season. Those who aren’t coconut lovers, never fear. Though it’s made with coconut milk and coconut cream, the coconut flavor isn’t prominent. In fact, my kids thought I had made it with traditional cow milk. 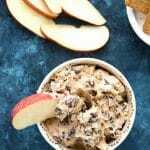 A sprinkle of the mini chips on top makes this dessert perfection with the rich chocolate flavor! 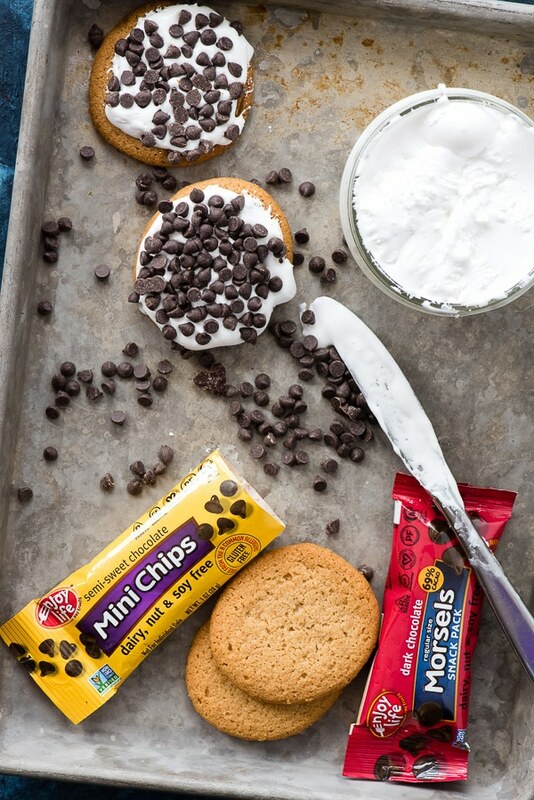 Something else we’ve loved using the mini chips for is No Cook S’mores. Great to make at home or for lunchbox fun. Graham Crackers (or Enjoy Life Vanilla Honey Graham cookies) spread with marshmallow fluff (I have a homemade organic marshmallow fluff recipe; it does include an egg and I’ve seen egg-free recipe on the internet too) and dipped in the mini chips (or the dark morsels too). Sprinkle them on yogurt, on celery filled with peanut butter (if nuts aren’t an issue for you) or by themselves for a sweet treat on the go. So any options to use these Snack Packs; have fun figuring out new ideas in your house! 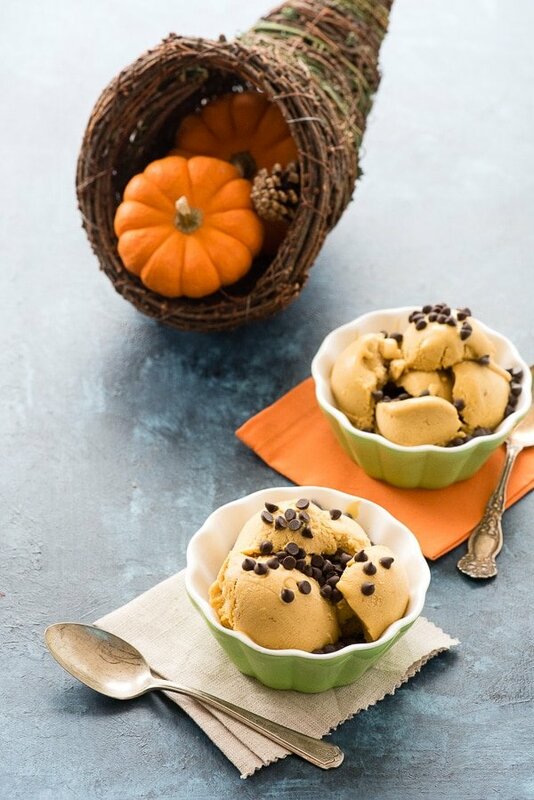 A perfect fall flavor in this vegan pumpkin spice ice cream! Easily made with an ice cream machine or without (instructions included). TOTAL TIME reflects use of an ice cream maker. Combine all ingredients except the vanilla extract in a medium saucepan. Bring to a simmer over medium heat, whisking to incorporate all ingredients. Remove from heat and stir in the vanilla extract. Making the ice cream with a machine: Place the mixture in the refrigerator to fully chill. Process through an ice cream maker to the manufacturers instructions. Spoon the ice cream into a freezer-safe container to allow to fully freeze overnight. Making the ice cream without a machine: Allow the mixture to cool to room temperature. Pour into a freezer-safe container and seal or cover with plastic wrap. Freeze until firm (6 hours to overnight depending on your freezer). Pumpkin Spice is the best season! This looks so delicious! This makes me so hungry. 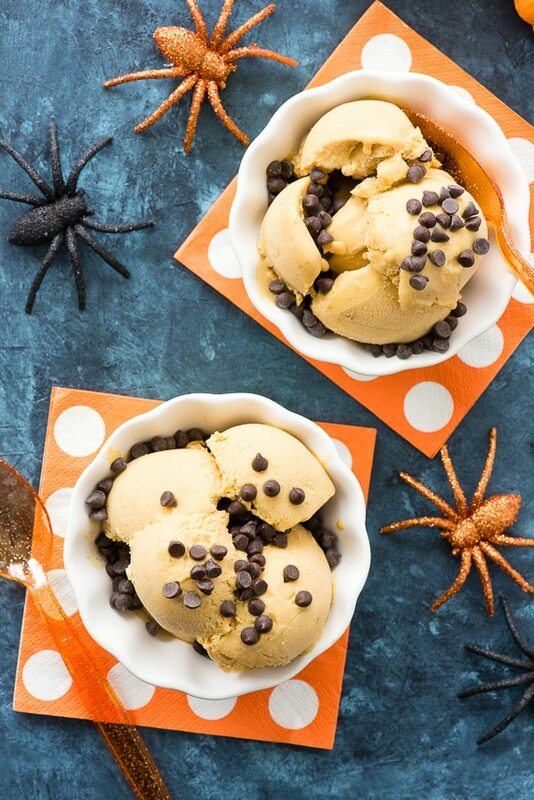 I’m not even a fan of pumpkin, but I’d eat this ice cream. You had me at pumpkin spice, but you kept me at vegan! We’ve been exploring more vegan dishes in our home and I know the kids will flip out for this. I can’t wait to try it. This is really good too! As I mentioned in the post, my kids thought it was a dairy recipe. I’m hooked! I have never tried vegan ice cream before, but from the looks of this I am missing out! I need to try delving into using more coconut-based ingredients. You wouldn’t even know it wasn’t dairy Amy! Ok this looks amazing. 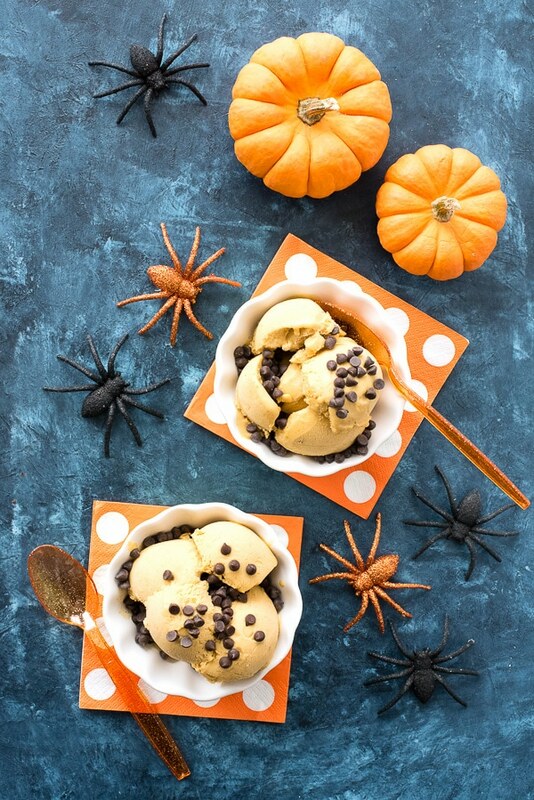 I am definitely making that pumpkin ice-cream! I love this time of year! Nothing better than pumpkin and chocolate this time of year. That is, until you make it ice cream! Sounds like the perfect fall treat, especially here where it’s still in the 80’s. Ironically I just heard we too are expecting temps in the mid 80’s tomorrow in Colorado too! So much for fall. I vote for ice cream all year round! Pumpkin sounds like the perfect flavor for this time of year! I had no idea Enjoy LIfe sold these mini candies! 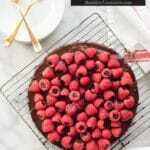 My family loves their chocolate – they were all surprised to hear it was vegan! I DO live in the US Ada and will confess I really did not like pumpkin until I became an adult. There are so many fun ways to eat it too, sweet and savory! That’s awesome! 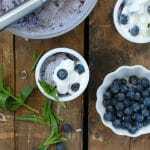 Everyone at home loves ice cream and it would be nice to make something this healthy for them! It’s going to be a huge hit with the kids! Yum what a creative idea for ice cream. I need to try pumpkin so I can see if I’d like this. I do love me a good ice cream! I hope you’ll love it Jeanine! how super cool is this. 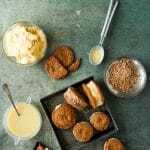 i have a few friends who just went vegan and they would totally appreciate this recipe. i will pass along. That looks absolutely delicious! I love pumpkin everything so I definitely have to try this. Pumpkin!!! I love all the different pumpkin recipes everyone shares. This looks so delicious! Uhm, this is great! I am in love with Enjoy Life Foods chocolates, and excited for the smaller packets! <3 Perfect time for Halloween too! Those chips are delicious and I love that they’re allergy-free. You can’t go wrong with this dessert idea! That sounds so good! I love this time of year for one thing: pumpkin everything. This ice cream sounds great!